I’m not one of those people who takes my laptop everywhere I go [Pfffffffft -Ed. ], but on a recent week long trip involving lots of walking through airports, I decided to take it this time and test out how the STM Evolution backpack performed with about 20 pounds of stuff in it. I’ve already been using it for several weeks, almost daily, commuting 13 miles round trip by bicycle, with less weight, so I’ve a pretty good idea of how it performs in a few different situations. Several features of this backpack are worth mentioning. First off, STM has done an excellent job making this a functional pack that has lots of storage and adjustable fit. Pockets abound in the rear double zippered accessory pocket. There’s plenty of compartments for pens, cables, cords, mobile phones, and such. There’s a built in zippered inner pocket as well that I find useful for storing loose items like change, receipts, and small office supplies like stickies or paperclips. The shoulder straps have an adjustable sternum strap that slides up and down to the wearer’s liking. There’s a waist belt and compression straps also to keep this bag as close to the body as possible that I thought work well. Reflective strips are located on front of shoulder straps and on rear of the bag for traffic safety which I like. The real function of this pack though is to haul a decent sized laptop and more gear and make it comfortable. There’s two main outer zippered compartments with two zipper pulls on each zipper. The sleeved compartment where your laptop will be stored is a hidden pocket as part of the backpacks main zippered compartment. Once you open the main zippers you pull the nylon loop and pull open the velcro securing it and voila, your laptop can be inserted into it’s own little home. I’m not a huge fan of the velcro tabs securing this laptop pocket because when you reach in to grab your laptop, it can snag on clothing or scratch on your skin. Plus, it looks cheap. Even though the velcro does seem to work well at keeping the laptop secured, is fast when opening, and simplifies the bag a bit more, I’d still prefer a zipper or a turnbuckle type fastener [I’m with you there, I hate velcro. Oh, sorry, I mean “rip and stick.” Wow, that roll of my eyes actually hurt. -Ed] . There is also a horseshoe shaped elastic extension built inside this pocket to help envelop your laptop to provide additional laptop cradling. This laptop pocket is lined on both sides with low pile fleece like material which is soft and won’t scratch. And to help prevent your laptop from flexing or getting damaged, there are reinforced and foam padded panels built into the bags walls on both sides of the laptop sleeve. They are not completely rigid, but they do help distribute possible pressures and cushion the laptop. The pack’s back panel even has a slight curve to it to better conform to one’s spine; especially helpful when leaned over on a bike. STM has given careful thought to protecting your investment by incorporating a very functional and attractive, rain cover made of durable treated fabric and is also reflective when headlights shine on it. Up here in the far NW of the US, I use the rain cover often. This rain cover is stored in its own pocket located on the bottom of the bag and is secured by two attachments features that I think are really smart. First, there are two small rings located on the top of the bag to connect the rain cover using small clips. Then, there is an elastic cord on the perimeter of the rain cover that you would cinch to tighten the cover securely. I suspect the clips are there to prevent the cover from getting pulled off by harsh winds. Even though it does take a little longer to access the bag contents with the rain cover, I found it’s not that big of a deal and find peace knowing that my bag and contents are staying dry [I didn’t know it was so easy to find peace. I can’t find it in just a backpack so I’ll have to keep looking. -Ed]. STM Evolution backpack has really good quality and feel to it. Two zipper pulls on exist on the external zippers, and the finish of the threading and seams looks to be able to handle what loads you may want to use it for. The weight of the pack is sort of heavy as I found I had a bit of sore back hauling the contents from one gate to another. The shoulder support straps are not heavily padded and that was noticeable with the pack loaded. Most things about this bag I like and are well thought out, but there’s one thing that bothers me every time I used it. During my recent trip, I tried using the external elastic cord to secure my bike helmet since the main pocket was almost full. While I was pulling on the cord to adjust the tension, the cords’ plastic termination piece flew off like a rocket. So I decided to just leave it off. I found this elastic cord can be hard to adjust quickly due to the material that holds the cord onto the bag, and doesn’t cinch down easily to accommodate loads. The material proved to be too grabby and it took some tug and release moves to position it where I needed it to be. SInce I was trying to secure a bike helmet, I found the cord to be a bit short for securing anything more than a light jacket so that’s what I ended up using it for. Overall, I like using this bag. I think the quality, fit and finish are excellent for carrying a laptop with extra gear. The bag’s appearance is very attractive as its grey color blends with many different outfits [A vital feature, surely. -Ed]. 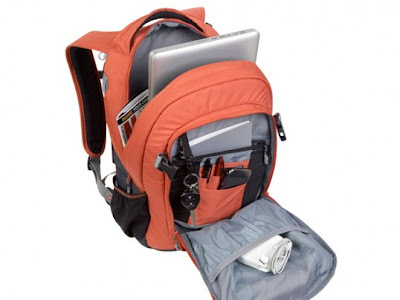 STM has made a great laptop backpack that will be more than capable and comfortable for most peoples’ needs.